Details of the known childern of Hugh Spence and Marion Selkirk. 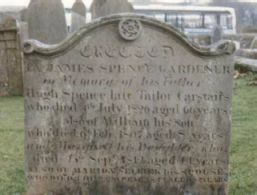 Janet Spence was the third of six children recorded in the Carstairs parish register, baptised to Hugh Spence and Marion Selkirk. Hugh Spence, died on 4th July 1826, and was buried in Carstairs parish church graveyard aged 66, according to the inscription on the headstone. The deaths of two of their children who had predeceased him, William who died on 6th February 1807, and Margaret who died on 25th September 1812, are also recorded on the headstone. Marion Spence, nee Selkirk outlived her husband by sixteen years dying on 2nd April 1842, aged 82, and a year prior to her death was recorded for the census of 1841 living with her youngest son, John, and his wife Marion Brown who he had married on 3rd February 1832 in Carstairs. 1841 Census (7th. June) Carstairs (633) Book 1. Page 22. Although no relationships were given in the 1841 census confirmation that this is her son John with whom she is living is given by his age and place of birth in the 1851 (Also by the names of John's eldest son and second eldest daughter as a couples eldest son was traditionally named after the paternal grandfather, i.e.. Hugh after Hugh Spence, and their second eldest daughter as after the paternal grandmother, i.e.. Marion after Marion Selkirk). 1851 Census (31st. March) Carstairs (633) Book 1. Page 31. John Spence and Marion Brown seem to have had at least six children, all baptised/born in Carstairs. Catherine, baptised 6th January 1833, Hugh born about 1835, Marion baptised 16th October 1836, Thomas born about 1839, Ann baptised 26th September 1841, and James born about 1845. Marion Brown was probably the Marion Brown whose baptism was recorded on 3rd June 1804 in Carstairs parish, daughter of Thomas Brown and Catherine Nairn. Thomas and Catherine were married on 23rd November 1788 in Carstairs and had at least a further two children: - Gilbert born\baptised 22 November 1789, and Catherine born\baptised 1st January 1792. Both events were recorded in the Carstairs parish register. As far as the parentage of Hugh Spence, there is a Hugh Spence baptised on 6th September 1756, the son of James Spence and Janet Locke, recorded in the Carstairs parish register. Although this would have made him aged 69 at the time of his death, not 66 as inscribed on the headstone, it would fit with the names of his eldest son and second eldest daughter as a couples eldest son was traditionally named after the paternal grandfather, i.e.. James after James Spence, and their second eldest daughter as after the paternal grandmother, i.e.. Janet after Janet Locke. James Spence and Janet Locke were married in Carstairs on 3rd August 1755.